Enter your email address below to be notified when this item becomes available. Nature Field Super Calcium 600+D3 400 – 100 Tablets is a dietary supplement that promotes bone health and may also reduce the risk of osteoporosis. Calcium is the primary mineral responsible for strong bones. Ou body also uses calcium for proper muscle contraction and nerve function. Vitamin D3 improves calcium absorption and helps to maintain a healthy immune system. Regular exercise and a healthy diet with enough calcium helps maintain good bone health. Each serving size of one table contains Calcium (as Calcium Carbonate) 600mg and Vitamin D (as Cholecalciferol) 400IU. Other ingredient include Stearic Acid, Dicalcium phosphate, Micro Crystalline Cellulose, Crosscamellose Sodium, Magnesium Stearate, Silicon Dioxide and Pharmaceutical glaze. Take as a dietary supplement. Adults should take one tablet one to two times daily preferably after meal with a lot of water. Keep bottle tightly closed, store in dry cool place away from the reach of children. The Holy Basil plant has a very long history in traditional Ayurvedic practices. In traditional Ayurvedic practices, Holy Basil, or Tulsi (its Hindu name) is worshipped for its ability to support overall health and wellness. ** The leaves, seeds, roots and flower have been used in ancient preparations. 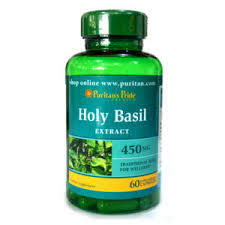 Holy Basil contains phytochemicals. Phytochemicals are compounds that are found in plant substances, such as flavonoids or carotenoids. No Artificial Color, Flavor or Sweetener, No Preservatives, No Sugar, No Starch, No Milk, No Lactose, No Soy, No Gluten, No Wheat, No Yeast, No Fish. Directions: For adults, take one (1) capsule daily, preferably with a meal. Other Ingredients: Rice Flour, Gelatin, Vegetable Cellulose, Vegetable Magnesium Stearate. WARNING: Not intended for use by pregnant or nursing women. If you are taking any medications or have any medical condition, consult your doctor before use. Discontinue use and consult your doctor if any adverse reactions occur. Not intended for use by persons under the age of 18. Keep out of reach of children. Store at room temperature. Do not use if seal under cap is broken or missing.